Our Friend, Randy Blood found this very interesting business ad for the good Dr. Lee. It provides some nice little details concerning how she handled her business. Once again, a great big thank you to Randy for becoming involved and locating some really nice little treasures. 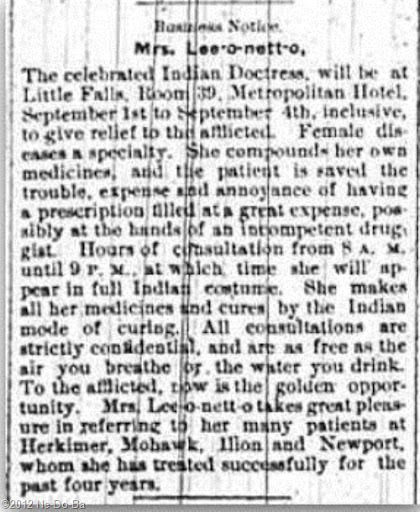 The celebrated Indian Doctress, will be at Little Falls, Room 39, Metropolitan Hotel, September 1st to September 4th, inclusive, to give relief to the afflicted. Female diseases a specialty. She compounds her own medicines, and the patient is saved the trouble, expense and annoyance of having a prescription filled at a great expense, possibly at the hands of an incompetent druggist. Hours of consultation from 8 A.M. until 9 P.M. at which time she will appear in full Indian costume. She makes all her medicines and cures by the Indian mode of curing. All consultations are strictly confidential, and are as free as the air you breathe or the water you drink. To the afflicted, now is the golden opportunity. Mrs. Lee-o-nett-o takes great pleasure in referring to her many patients at Herkimer, Mohawk, Ilion and Newport, who she has treated successfully for the past four years. Little Falls is located in Herkimer County and sits along the Erie Canal. Herkimer, Mohawk, and Ilion are also located along side the Erie Canal just west of Little Falls. Newport is to the north of these towns. These towns are also located near to the old Brothertown tribal lands in NY. Perhaps Isaac was drawn back to the region of his birthplace. It appears Dr. Lee makes her money solely from the sale of her remedies, since her consultations are free. She certainly does put in long days, 13 hours. How wonderful would it be to locate a picture of her in “Indian costume”. There must be some out there somewhere. Historical Societies should be checked for old hotel archives. Dr. Lee tells us she have been seeing patients in this region for four years, so from about 1880. This is quite a ways from Stockton (where she was in 1874), so perhaps she is living somewhere in the general vicinity. Her husband, Isaac, is found alone in Addison, Steuben Co., NY in the 1880 Census. Perhaps they have already split up by 1880. If so, it was a short marriage. I was unable to locate Dr. Lee in the 1880 census, but now I have a better idea of where she might be. Perhaps I will take another stab at locating her. Hello. I was doing a little research myself and found some interesting information. I have some old scanned family photos from my husband's family and one that I've always found particularly interesting is the picture of Paul's Great Grandmother's Aunt….Dr. Lee O Netto. (At least I think this is their connection) I have a couple photos of her if you're interested. this is a large capacity mail box. Thank You for taking the time to leave a comment. I look forward to receiving your items.